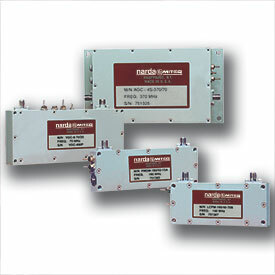 L3 Narda-MITEQ manufactures two distinctly different types of Frequency Discriminators. Both types are utilized to convert an input frequency to a bipolar DC voltage corresponding to frequencies above and below crossover (center frequency). Typical applications of Frequency Discriminators include automatic frequency control (AFC) systems and high-fidelity FM demodulation systems. The narrow bandwidth type uses an input limiting amplifier to drive two staggered tuned L-C circuits. Opposing rectification of the circuits create the discriminator 'S' curve. A video amplifier is utilized to provide adequate output slope (specified in mV/MHz). The ability to precisely align the skirts of the tuned circuits, which represents the linear bandwidth, is the major advantage of this type of design. The wide bandwidth type of Frequency Discriminators employ delay line techniques to achieve the desired frequency detection. A limiting amplifier drives an in-phase power divider, where one port is delayed an appropriate amount and applied to a double-balanced mixer being used as a phase detector. A wide bandwidth video amplifier takes advantage of this design's extremely wide demodulation bandwidth. The ability to process narrow input pulse widths with minimal distortion is the fundamental advantage of this type of frequency discriminator. Typical specifications for frequency discriminators include frequency accuracy within the linear bandwidth (expressed as a percent of deviation from a best-fit straight line), crossover accuracy and demodulated video bandwidth. Frequency accuracy (commonly known as linearity) measurement is achieved using a computer-controlled RF generator, which is step incremented through the specified linear frequency range, and a digital multimeter to record the video output voltage. The result is a plot of measured output voltage, corresponding to input frequency and its deviation from a best-fit straight line using a linear regression formula. In many instances, the demodulated video bandwidth can be approximated. This is achieved by dividing 0.35 by the measured video rise time. Alternatively, a more appropriate form of measurement is to modulate the carrier with a suitably wide baseband signal and use a spectrum analyzer to display the modulated video output. The -3 dB point of baseband signal can then be measured directly. 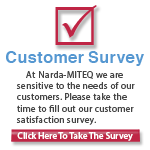 For over a combined 60 years, L3 Narda-MITEQ has been customizing to our customers specific requirements. This can include new design efforts, modifications to existing designs for performance and mechanical needs, as well as additional testing and environmental screening.